A lung abscess is an infection of the lung parenchyma resulting in a necrotic cavity containing pus. • Incidence has decreased over the last 30 years as a result of antibiotic therapy. • Lung abscess in patients age 50 and over is associated with primary lung neoplasia in 30% of the cases. • Lung abscesses commonly coexist with empyemas. • The most important factor predisposing to lung abscess is aspiration. • Following aspiration as a major predisposing factor is periodontal disease. • Lung abscess is rare in an edentulous person. • In most cases anaerobic infection is mixed with aerobic or facultative anaerobic organisms (S. aureus, E. coli, K. pneumoniae, P. aeruginosa). Lung abscess may be primary or secondary. 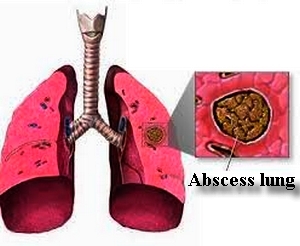 • Primary lung abscess refers to infection from normal host organisms within the lung (e.g., aspiration, pneumonia). • Secondary lung abscess results from other preexisting conditions (e.g., endocarditis, underlying lung cancer, pulmonary emboli). Lung abscess may be acute or chronic. • Acute lung abscess is present if symptoms are of less than 4 to 6 wk. • Chronic lung abscess is present if symptoms are greater than 6 wk. • The workup of a patient with lung abscess attempts to elicit a primary or a secondary cause. • Blood tests are not specific in diagnosing lung abscesses. • Most diagnoses are made from imaging studies; however, to diagnose a specific cause bacteriologic studies are needed. • Penicillin 1 to 2 million units IV q4h until improvement (e.g., afebrile, decrease in sputum production, etc.) followed by penicillin VK 500 mg PO qid for the next 2 to 3 wk but usually requiring longer 6- to 8-wk courses. • Metronidazole is given with penicillin at doses of 7.5 mg/kg IV q6h followed by PO 500 mg bid to qid dosing. • Clindamycin is an alternative choice if concerned about penicillinresistant organisms. The dose is 600 mg IV q8h until improvement, followed by 300 mg PO q6h. • Brochoscopy to assist with drainage and/or diagnosis is indicated in patients who fail to respond to antibiotics or if there is suspected underlying malignancy. • Surgery is indicated on rare occasions (<10%) in patients with complications of lung abscess mentioned below.